Of all the crazy things I’ve done in life – and there have been a few – participating in yesterday’s Escarpment Trail Run has to rank among the craziest. When, just more than half way through the 30 kilometer, six-mountain course, the skies – having long ago darkened and offered up the worrying rumble of approaching thunder – opened up with the vengeance of Thor himself, dropping hail the size of corn on my head at the very point I was climbing Stoppel Point hand over fist, sending out lethal bolts of lightning all around and issuing cascades of thunder so loud it felt like I was inside the middle of the storm (and at 4000 foot elevation, I was indeed, right inside the middle of the clouds), I experienced a brief moment of what some might call common sense, when one part of my brain sent a signal to another that maybe I should be at home right now, curled up with the Sunday paper and staying warm and dry rather than racing a dangerous course that most hikers can’t face in a full day. And then, as I emerged from one of Stoppel’s three enforced climbs onto one of its three welcome jogging interludes, a woman my own age (admittedly the consistently fastest Masters female in the region) trotted up behind as if from out of nowhere, rounded me and disappeared briskly into the distance, looking for all the world as if she was just enjoying a gentle stroll in the park… and I remembered that there was nowhere home from here but the finish line, another five treacherously slippery mountainous miles off in the distance, and the sooner I could get there, the sooner I could get warm and dry. Alright, I admit it. I loved it. There’s really no better way to feel alive than to participate in something that could, on a day like yesterday, kill you. (Or, at the very least, cause a few broken bones.) Fortunately or otherwise, I’ve been at the peak of fitness this year, I’d trained well for the race, and got as much sleep as possible in the week leading up to it (allowing for the thunder and lightning storms on Saturday night that, it turned out, kept most runners awake for several hours). I set a goal for myself of 4:20 (the first and only time I ran the Escarpment, two years ago, it was in 4:29), and met almost every one of my split points at exactly the time I’d hoped for. By the point I reached the top of Stoppel, however, the rains had turned the last four miles – essentially downhill, but highly “technical,” which means you have to scramble and jump down several rock faces, maneuver over sharp jagged rocks on the flat parts, run along cliff ledges that drop 1000 feet or more, and so on – into a complete slime fest. With the rocks having all the grip of olive oil, I took one nasty fall onto my back that temporarily pulled my calf muscles and more permanently cut open my shoulder and decided to put safety first from there on in. At the end of the race, by which point I felt I understood the true meaning of the verb “to bucket,” I was running literally inside the middle of the rainwater streams that had decided to invade what passes for a trail, themselves following the point of least resistance to the finish line. I came home in 4hrs, 25 minutes, with a great big smile on my face and feeling pretty good about running such a consistently-paced race. In fact, it’s the only time since my first Marathon in 2002 that I hadn’t hit the “wall” – and avoiding that miserable sensation is well worth five minutes off your intended time. Having seen the results, I feel even better; my placing (47th out of nearly 200) would, in normal years, have demanded a time closer to the four hours I hope one day to be achieve. No pictures from yesterday, I’m afraid. The rain put paid to that. Posie took this one at the start line two years ago. 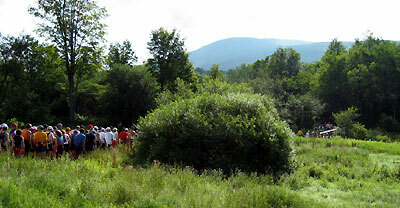 In the distance is Windham High Peak, three-plus miles steady uphill – the first of five or six peaks, depending how pedantic you are about what qualifies as a peak. If there was a real downer to the downpour (because honestly, it made the whole event somewhat comical), it was the anticlimax at the finish line. The North-South Lake State campground is one of the most beautiful spots in the Catskills. Normally, race finishers head slowly to the lake to cool down their aching limbs and then hang out all afternoon either on the beach or the field by the finishing line, enjoying picnics with their families or just their new-found running friends. You can usually see a few six-packs going around; last year, when I volunteered at the finish line, one guy who drove in from Detroit and camped at the park itself brought his excellent home brew with him. No such fun in 2008: I came across the finish line to see a crowd of about 100 people, my wife and kids among them, huddled and massed under the food tent, all with barely an inch to move as the park turned into a mud field. Campbell’s first words to me? “Can we go now?” Not the most polite or congratulatory of welcomes, but I understood his point: it can’t have been much fun for a 12-year old to spend an entire hour waiting for me in such cramped and confined quarters. Had I known we’d be in for this kind of storm, I’d have encouraged the family to stay home. Instead, I ran (yes, ran) to the car to get warm clothes, got changed, grabbed some bagels, checked off some friends, and headed home for a warm bath and that Sunday paper. Where was this guy when I needed him yesterday? As I’ve mentioned before at iJamming! when writing about this race, there are no medals dispensed, no awards, not even a free t-shirt. (Not until you run six races, at which point you join the 100-mile club; then you get a free t-shirt.) Unlike the New York Marathon, where a million or two people cheer you along and your name is printed in the following day’s New York Times, few people know about this race. But those who do, know all too well its reputation and its qualifying standards – they call it the Boston Marathon of trail running – and when you meet such like-minded folk, you get bragging rights worth so much more than a medal that stays in a box until you forget where the hell it is. Am I sore today? You bet. Will I run it again next year? You know the answer to that one, too. Hey, four more years and I get a free t-shirt! Using 10cc for your title? Great job – awesome day! You wrote, “having seen the results” – where ? Because of the rain, the results were being kept under wraps, literally: I asked to see my placement from the finish crew before leaving for home. They’ve not yet been “posted” far as I know. But I know Ben Nephew won in a fraction under 3 hours (thereby missing the storm) and that the times were much much much slower than most years. For obvious reasons. The link to your pics doesn’t work right now. Would love to see them and maybe even use a couple here if possible?